Checking out Cosma Shalizi's Three-Toed Sloth, discovered that David Freedman had died. (Freedman is the Freedman of Freedman, Pisani and Purves, Statistics, a splendid introduction to the subject, as well as, I gather, a quantity of articles that would put Mr Updike to shame.) The obituary on the Berkeley website says: Freedman worked on martingale inequalities, Markov processes, de Finetti’s theorem, consistency of Bayes estimates, sampling, the bootstrap, procedures for testing and evaluating models, census adjustment, epidemiology, statistics and the law. How green was your valley. How do grammar schools select children? The short answer, according to the national school admissions code, is by "ability". Their way of assessing ability is mainly by a combination of English, maths and reasoning tests. A minority use a head teacher's report as well, for borderline cases. Sometimes individual schools select, and sometimes local authorities or groups of schools. Some grammars and local authorities are selecting a heavily disproportionate number of children born early in the school year. In the most extreme cases there are twice as many of the older children compared with the younger ones. The dominance of older children vis-à-vis younger ones follows a progressive pattern over the year. At every month after September, a child's chance of getting into the grammar sector declines. This could mean that some able summer-born children are not getting into grammar school. Earlier research shows the average September-born child performs better than the average August-born child in school exams - possibly because they have had more months to mature, and perhaps because they have a psychological and physical superiority over their classmates at the beginning of their school days that hardens into academic superiority. Many grammars and authorities respond to this by adjusting their results for age - pushing the marks up for younger children and down for older children. Theoretically this should eliminate autumn preponderance. But there are two possible flaws to this - that schools may not be adjusting enough for age when marking exams, or that they are not accounting for age when considering head teachers' reports. It may be that schools do not know that their admissions are in effect age-biased. Alternatively, some may know they are, but are deliberately selecting the older children. A couple of readers have expressed interest in reading more by Zygmunt Bauman. Bauman's most important book, the one that introduced themes he has since explored in many that followed, is Modernity and the Holocaust. Bauman argues that the Holocaust was a by-product of certain features of modernity: the extreme specialisation, the breaking down of work into small narrowly defined tasks whose relation to the whole is not evident, the incorporation of these tasks into highly hierarchical structures (so that part of doing a good job is not simply performing the task but facilitating the smooth transmission of commands and responses up and down the hierarchy) - all these appear to be necessary to a particular kind of rationality, that which enables a society to provide goods and services for very large numbers of people and to direct the labour of these people effectively. When I was in school the Holocaust was THE event in modern history that everyone was expected to study - but as far as I can remember no attention was paid to the machinery which makes such an event possible, or how one might put safeguards against abuse into the institutional structures of one's own society. I'm afraid no school or university I ever attended showed any awareness of the moral implications of its bureaucratic structures; I've never dealt with a government agency anywhere that showed any such awareness; never dealt with any kind of health facility that showed any such awareness. So, yes, a book everyone should read. The problem with being an obsessive reader is that one's response to reading a book is likely to be to read more books. If one reads Modernity and the Holocaust, one's immediate response is to rush out and pick up Liquid Modernity, Modernity and Ambivalence, Life in Fragments, Wasted Lives: Modernity and its Outcasts (I could easily go on, but you get the picture). It would probably be better to rush out and join one's local LETS (Local Exchange Trading System), for example, but old habits are hard to break. Madeleine Bunting's profile of Bauman in the Guardian in April 2003 was the piece that introduced me to his work, here. After I posted pictures of the new Fog Creek office, a lot of people wrote to ask if they could visit it. So we're holding an open house here on Friday, January 30th, from 12:00-1:00 pm (absolutely no one can be admitted after 1:00, sorry). There will be free food and drinks. If you're going to be in New York, we'd love to meet you and show you around! The address is below. RSVP not necessary. My father, John DeWitt, was a Foreign Service Officer. His first overseas posting was to Monterrey, Mexico, where he worked 8 hours a day issuing (or not, as the case might be) visas. He was the American Consul in Cali; Consul General in Guayaquil; in Rio de Janeiro; in Paris. For much of his career, in other words, he dealt directly with the question of who could and who could not be given a document permitting travel to the United States. In the early years he was one of the very young people who are given a set of procedures to follow and then face an endless stream of human beings whose circumstances may or may not fit the procedures - at the risk of stating the obvious, this work generally is given to the very young, people on their first or second tour of duty who want to be perceived as doing a good job by their superiors so they can graduate from the crap job to something more intellectually challenging. In later years he was the head of mission, the person all those very young people needed to impress; if they were only following orders, they were not, of course, following his orders (the procedures come from a very long way away), but he was the one to whom difficult cases might ultimately be referred. Or not, as the case might be. Because the obvious way to look good if you are processing visa applications is to be efficient, to keep the number of cases perceived as difficult to the absolute minimum - not create work, cause problems, for your immediate supervisor, and definitely not create problems by, say, challenging or bypassing your immediate supervisor and going straight to the top. To put it another way, if you're head of mission, the obvious way to keep your workload down to a manageable 12 hours a day plus weekends plus diplomatic schmoozing, is to make subsubsubordinates think twice before bothering you with visa queries that are comprehensively covered in the procedures. So let's say you're a consular officer in Germany in the 1930s. You are living under a profoundly anti-Semitic regime; Jews are being progressively stripped of civil rights, there are pogroms which go unchallenged by the police, you get more and more visa applications from people who, at the risk of stating the obvious, don't see a tourist visa as the answer to their regrettable deficiency with respect to Aryan descent. Maybe they apply for the visa they actually need, and don't qualify; or maybe they cunningly apply for a tourist visa when they have every intention of remaining in the country if they possibly can - in which case it is your job, as a consular officer, to get to the bottom of this and determine that this is not a genuine application for a tourist visa, and reject it. It was not so much that transcendence makes things better; it was, rather, that things as they are are not good enough. ... Fortunately for someone blessed with a tankful of fuel, 'things as they are' can be moved away from: they do not have enough pulling power. They are devoid of authority, of good enough reason to be what they are, unless shaped and reshaped on purpose, to the measure of the current human capacity to shape. The easier we move away from things, the less authority we are inclined to allow them; our ability to move away is the measure of their arbitrariness, and so - in a world governed by reason - of their unbearability. The need to change and the ability to change prompt and define each other. One reason a Jewish state, with the right of return for ALL Jews, looked so desperately important, was precisely that even the most deadly forms of anti-Semitism were not enough to get a Jew past consular officers who were just doing their job. We may note that many would-be emigrants wanted go to an America that was in the grip of the Great Depression; it was not a good time. Now is not a good time. Hillary Clinton is now Secretary of State. I'm sorry to think she never had the chance to meet America's Angriest Consul. Your critics blame your monetary policies for Zimbabwe's economic problems. I've been condemned by traditional economists who said that printing money is responsible for inflation. Out of the necessity to exist, to ensure my people survive, I had to find myself printing money. I found myself doing extraordinary things that aren't in the textbooks. Then the IMF asked the U.S. to please print money. I began to see the whole world now in a mode of practicing what they have been saying I should not. I decided that God had been on my side and had come to vindicate me. I was trying to think of a way to explain Puppet Stayman to Evan Lavender-Smith, and not really succeeding, which is not to say I did not send him a long e-mail on the subject but to say that it does not bear repeating. Meanwhile there is an amazing post on Language Hat on the politics of Central European languages. A reader once wrote to ask: Do you really think learning Arabic will make people stop killing each other? I assure you this is wrong. I'm sure she's right. There may be some piece of knowledge whose acquisition would persuade people not to fire rockets at schools where children are hiding under desks; if I knew what it was, I would certainly publish it on this blog. Supposing, that is, that it was an abstruse piece of information not readily available, something no newspaper or commercial publisher would touch, so that one could only get the closely guarded secret out into the world by blogging. Since I don't know what that remarkable piece of information might be, I pass on instead information about the SOAS Arabic course. This is somewhat abstruse, since the course is normally sold only at the SOAS bookshop. 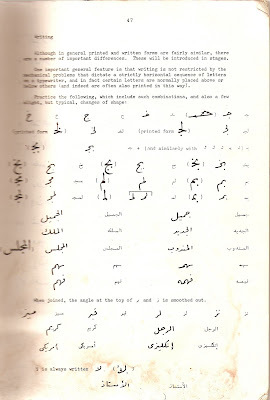 I found it useful for learning such Arabic as I know. 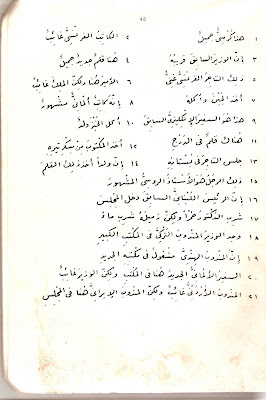 Those who think they might find Arabic useful, but are nervous that it might weaken their resolve to bomb civilians, can, I suspect, make use of the course with perfect equanimity. 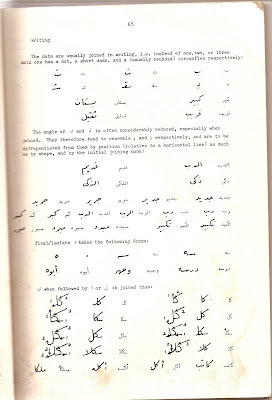 I once did a two-term course at Oxford on reading Arabic. The Oriental Institute rejected out of hand my request to attend the undergraduate introduction to the language, which met every day at 9 and included the spoken language, the view being that it was irrelevant to my doctorate and might interfere with work on it; Mustafa Badawi persuaded them the following year to let me take the two-term MA course instead. 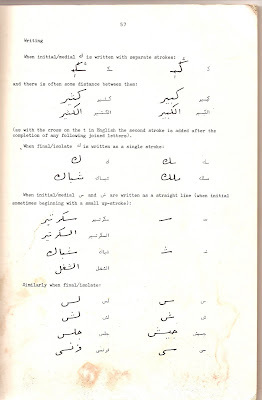 I then spent some time using the SOAS course at the University Language Centre. This was back in the mid-80s - back in the days, in other words, when PCs still had a drive for 5.25-in floppy disks and the internal hard drive had either not been invented or was not commercially available - so the the audio course was on cassette, or rather cassettes, lots and lots and lots of cassettes. (It's a shame, but perhaps not surprising, that no one has had the energy to transfer this mass of cassettes to a more readily accessible format: Joseph Burridge, of the SOAS bookshop, tells me the course is still being used by undergraduates; the books can be bought, but the audio materials are not commercially available.) It's not at all clear to me that this time-consuming, inefficient way of tackling the language was any less damaging to my doctoral research than simply taking the course that met at 9am, but Jones aliter visum. Beginners tend to rely heavily on dots as a means of identifying letters, so the note on written treatment of dots is well worth having early on. It may be that other introductions to the language give similar sets of exercises on writing and reading handwritten text; I mention this one since it's not normally available in shops and readers are unlikely to come across it. Email/phone your credit card number, expiry date & security code (+ issue number if your card has one) or send a cheque payable to 'Arthur Probsthain Bookshop'.